Last month the UK’s Department of Health quietly redefined the term “genetic modification” to open the door to allow certain kinds of modification of human embryos – thus potentially making it the first country in the world to allow genetic engineering. Scottish journalist Lori Anderson recently raised the alarm over the change in a column in the Scotsman, in which she alleged that the change is designed to “dupe” the British public into accepting “full-scale germline genetic engineering,” using human embryos as test subjects. 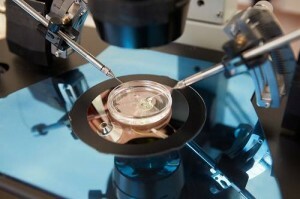 This change follows a statement from the Human Fertilisation and Embryology Authority (HFEA), the government body that regulates experimental research on human embryos, approving the procedure to create an embryo from one couple’s gametes but with genetic material added from a third party donor, a procedure called in the press “three-parent embryos”. The HFEA, which throughout its history has been known as one of the world’s most permissive regulatory bodies, has been working steadily towards allowing genetically modified embryos to be implanted in women undergoing artificial procreation treatments. In a document issued to the government last year, they called the insertion of mitochondrial DNA (mDNA) into embryos “mitochondrial donation” or “mitochondrial replacement”. mDNA is the genetic material found in the cytoplasm outside a cell’s nucleus, problems with which can cause a host of currently incurable genetic illnesses. “Mitochondria replacement (or mitochondrial donation) describes two medical techniques, currently being worked on by UK researchers, which could allow women to avoid passing on genetically inherited mitochondrial diseases to their children,” the statement said. The HFEA admitted that the techniques are “at the cutting edge of both science and ethics” and said that the results of a “public consultation” in 2012/13 were being examined by the government, which is considering “draft regulations”. He quoted Professor Andy Greenfield, the chairman of the scientific review panel that approved the techniques, who said that there is no way of knowing what effect this would have on the children created until it is actually done. “We have to subject children who have not consented and cannot consent to being test subjects,” Tully said. Altering the mDNA of an embryo is what cloning scientists refer to as “germline” alteration, meaning that the changes will be carried on through the altered embryo’s own offspring, a longstanding goal of eugenicists. In their 1999 book, “Human Molecular Genetics” Tom Strachan and Andrew Read warned that the use of mitochondrial alteration of embryos would cross serious ethical boundaries.